A stand-alone unit - does not require any installation. 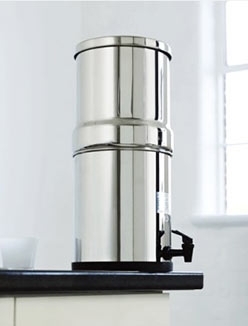 Comprises 2 stainless steel containers with a stainless steel lid, ceramic filter cartridges and a tap. Portable. Works to a far higher standard of filtration than a typical jug filter. It has 2 filter cartridges which will last for one year. The ceramic shell removes harmful bacteria, parasites & sediment and the volume of filter media is sufficient to last for a year It contains two types of activated carbon for removal of particulates, aluminium sulphate flocculates, chlorine, organic pollutants such as pesticides, herbicides, benzenes, phenols and many other toxic chemicals. It also incorporates a specialised ion exchange resin for the removal of heavy metals. The filtration is made even more thorough by the slow passage of water - it takes one hour for the production of 1 litre or pure water. 1) Are gravity filters plumbed in? 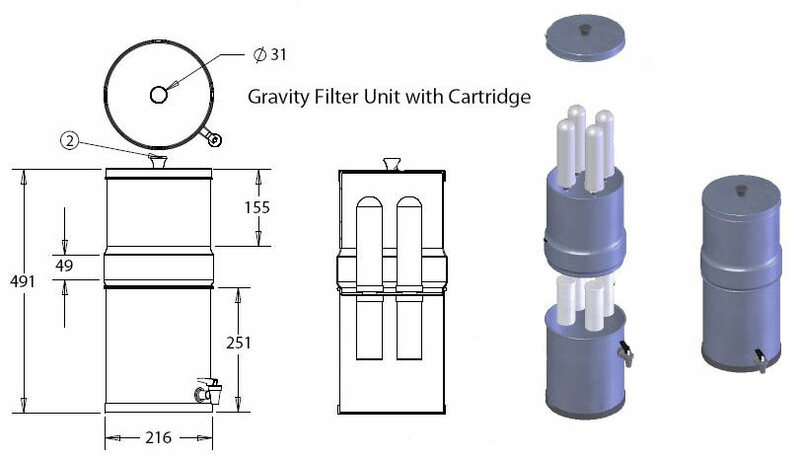 No, gravity filters are not plumbed in, which makes them great for use in temporary accommodation or out in the field where are ready supply of potable water is unavailable. To use, simply fill the upper container with water. The force of gravity means that dirty water passes though the ceramic cartridges and clean water collects in the lower cabinet. 2) What is a ‘silverised' ceramic? Our ceramic cartridges are impregnated with silver which prevents bacterial growth on the cartridge. 3) Is it safe to use the filter after it has been idle for a long period? Yes, though it would be best to sanitise the unit before using it again. Add ‘Puritabs' or another sterilising agent to water in the upper compartment and allow the solution to pass through the normal filtration process. This will remove any build up of bacteria that may have occurred. You may also want to clean the cartridges by brushing them gently under cold running water. 4) What kind of flow rate can I expect? The GS2 can produce up to 50 litres of pure water a day. 5) How much water can the container hold? The lower canister holds 7 litres of pure water. 6) Can I remove fluoride from my water? Yes, Use GS2 Fluoride Candles 2 x FL-12-CP17 in addition to your regular cartridges you can remove fluoride. 7) Can I remove nitrates from my water? Yes. Use GS2 Nitrates Candles 2 x N-12-CP17 in addition to your regular cartridges to remove nitrate. 8) Can I remove limescale form my water? No, the gravity filter does not remove hardness from your water. Minerals such as calcium and magnesium, which cause limescale, are considered extremely beneficial to health. 9) How often should I change the cartridges? We recommend that you change your cartridges every six months to a year to maintain optimum performance.